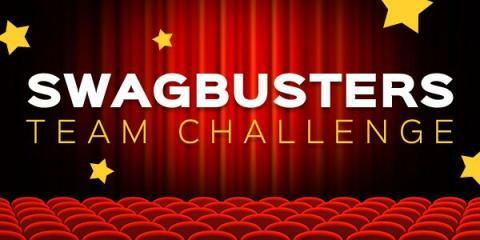 Being Frugal and Making It Work: Join the Swagbusters Team Challenge TODAY!! Encrave – Discover great content, earn SB, and contribute 25 pts to your team! Search - Grab rewarding search wins through the Swagbucks Search Engine & contribute 20 pts to your team! SwagButton - Just by having the SwagButton on your desktop browser, you will contribute 15 pts to your team each day of the Team Challenge. Swagstakes - Are you feeling lucky? Redeem your SB for a Swagstakes entry! Contribute 15 pts to your team. Referrals - Spread the Swagbucks love! Contribute 15 pts to your team when you have a referral register during the Team Challenge. Special Offers - Earn SB discovering Special Offers! Contribute 10 pts to your team. Mobile Offers - Have a busy lifestyle? Earn SB on the go with Mobile Offers! Contribute 10 pts to your team. Mobile Videos - Waiting in line at the grocery store? Watch SBTV Mobile anywhere and anytime! Contribute 10 pts to your team every time you fill up your SBTV meter. Swag Codes - Redeem daily Swag Codes through the SwagButton browser extension or the Swagbucks Mobile App! Contribute 5 pts to your team. Not a Swagbucks member yet? It's how I get gift cards to spend on shopping, holiday gifts and more... I redeem my #Swagbucks for Amazon gift cards and then use them to purchase Christmas gifts for my two children each year! It is the most rewarding online earning site that I participate in! And with many different SB-earning opportunities like the Swagbusters Team Challenge, you can get your first gift card even faster. Sign up HERE and start earning TODAY! !